Join Angela Yeh at the 2016 IDSA Northeast District Design Conference tomorrow April 30! Have questions about innovation trends and cultural shifts in the industry? REGISTER and ask Angela today! Come celebrate our 10th anniversary with us and register for Design Summit 2016 ! The role of design has shifted and has become more impactful than ever before. Management consulting and professional service corporations are acquiring design firms and annexing creative offerings to their portfolios. Leading corporations are building design proficiency in house, VCs are building innovation advisement on their boards, and innovation divisions into the ventures they back. Startups include designers as founding partners and companies expect strategic design to be part of the corporate agenda. Design has become a movement from the periphery to the heart of businesses. Our panel of experts will discuss how to qualify, structure, and keep a creative team and culture aligned for success. Join us in learning how to organize and envision a better future and experience for your designed culture. Each year at Yeh IDeology, we mark our anniversary with a Design Summit, inviting industry luminaries to share their challenges, insights and strategies to scaling for growth. We hosted this year's #YehSummit at Knoll's beautiful showroom in the heart of Manhattan, kicking-off and closing, with more wine than water. Enjoy the photo recap below, and tune in for our video recap where we interviewed speakers and guests of the evening. Dear friends of Yeh IDeology, We are raffling off a free ticket (worth $495) to our Yeh ID community! Winner receives full access to the global UX Summit with You in UX this May. You in UX is an online, virtual summit with an incredible line up of top UX mentors from around the world. Take a look at their program agenda. Please click here to access the raffle. Entries must be submitted by May 1st. Do you ever wonder what it takes to explore new territory? Do you want to lead the next generation of UX pioneers? If so, join us at You in UX Summit this May to gain invaluable career insight with some of the best UX mentors around the world. Angela of Yeh IDeology will be speaking at You in UX Summit on May 7th at 3pm PST. You in UX is an online, global summit with an extensive three-week lineup that includes speakers from top UX executives, CEOs and presidents from companies like Amazon, Google, Microsoft, Yahoo!, BlackBerry, SlideShare and more. You in UX grants you global access to more than 30 customizable sessions. This is your opportunity to ask questions for world-class UX role models and mentors. For the program lineup, please view the link here. Be inspired and cultivate your talent. Join us at You in UX. 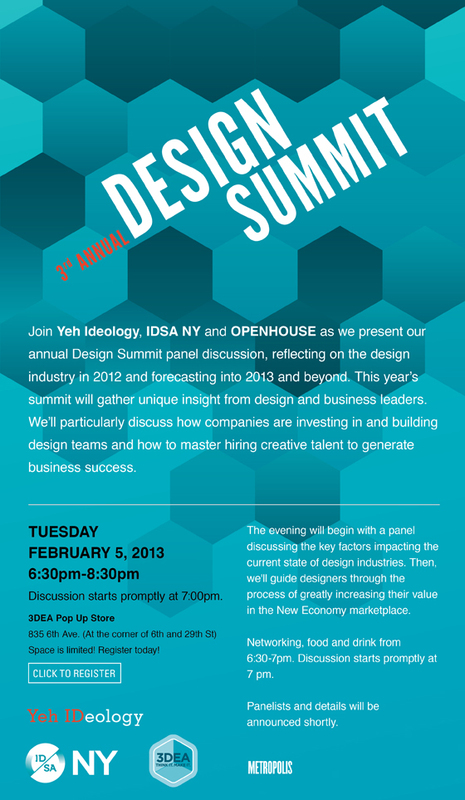 In partnership with IDSA NYC, Yeh IDeology hosted the 4th annual Design Summit on February 27th. This year’s design summit featured a panel of cross-disciplinary design leaders including Erica Eden (Founder of Femme Den and Global Director of Design Innovation of PepsiCo), Rich Thrush (Director of Kaz Incorporated), Mei Mah (Deputy Director of Education at Cooper Hewitt), Dan Grossman (Deputy Design Directory of Martha Stewart Living Omnimedia). Our theme of Making It Real was rooted in understanding design as an ever-expanding discipline that is actively shifting both creative and business cultures. We questioned the role of design in today’s complex business landscape? How do different design fields cross-pollinate? How will this shape the future of design? Are these trends here to stay or go? Eden’s advice, “be shameless” and take risks exploring and discovering. When you know your super power, hold onto it and remember to design to solve the problem. Share with us your thoughts! Join Yeh IDeology, The Industrial Designers Society of America and OPENHOUSE as we present our annual Design Summit panel discussion, reflecting on the design industry in 2012 and forecasting into 2013 and beyond. This year’s summit will gather unique insight from design and business leaders. We’ll particularly discuss how companies are investing in and building design teams and how to master hiring creative talent to generate business success. The evening will begin with a panel discussing the key factors impacting the current state of design industries. Then, we'll guide designers through the process of greatly increasing their value in the New Economy marketplace. Networking, food and drink from 6:30-7pm. Discussion starts promptly at 7 pm. Register Today! Space is filling up quickly! RSVP: Space is limited! Register here! Last week Monday I spoke to the Resource Directors Association for their annual Career & Money meeting. I met Eileen Rasgdale, the president of RDA at last year's Cooper-Hewitt Teen Fair that Yeh IDeology has been asked to participate in for the last several years. Eileen asked me to come speak to RDA regarding the changes impacting the architecture industry and give advice on how to adjust and navigate these changes. The RDA is a not-for-profit professional network of resource persons working in the Architecture and Design community and their mission is to share knowledge of new products, specification issues and news and changes within the industry. They have chapters in Boston, Chicago, Minneapolis, New York, Philadelphia and Seattle. As everyone went around the room sharing their backgrounds and their top concerns in this intimate group setting it quickly became apparent that this group of creative professionals were dedicated and passionate about their field. We talked about how the shift in this new economy had affected their industry as well. For some members' companies had either down sized or taken on more account but overall the main impact was that the work load and responsibilities were doubled. We talked about ways for members to prepare for these changes and how to position themselves to take advantage of these new shifts and yet set reasonable expectations for those around them as their responsibilities change. Having been actively involved in organizations like IDSA and being on their board of directors, we also explored various solutions and ways RDA the organization could support the members individually. It's indeed challenging time these days and regardless of the industry, the ways that companies have been structured and have always done business has changed. Yet at the same time these drastic times of change in history are often the ripest moments to implement change for the better and improvement. Status quo has been upended and everyone is more receptive to change. I talked about how the new normal in this new era is "adaptability" and those that will make it in this new era will be the ones that look ahead to predict the next industry shifts, adjust to them and be ready to embrace them. Collectively this was a strong dedicated community and it was refreshing to see that many great ideas were already there percolating waiting to be acted on. I look forward to seeing how the members of RDA collaborate and navigate this new era. Here I am with a few of the members as we lingered after our lecture admiring the gorgeous furniture at Suite NY, who generously hosted the event. Thanks to Eileen Rasgdale and the RDA for having me come speak. Our workshop "Branding You and Connecting to Your Target Market" was a huge success as heard from IDSA and all the unsolicited comments we received from IDSA.NED conference-goers. As our talk was one of the first workshops to start off the conference on Friday morning, it set the tone for the rest of the conference for many of our attendees. Throughout the conference, whenever one of our attendees met another workshop attendee, they would compared notes and connected each other to new people, teaching new people in the long run this new networking game. I have to admit I absolutely love to speak and lecture. There's something to finding the commonality of a group's needs and speaking to that need and cause and inspiring change. Being able to teach an entire group to change from one frame of mind to another state is thrilling, and when done successfully it's amazing what energy and inspiration can be generated from that moment. Held earlier this month at the IDSA Northeast District Conference at the Rhode Island School of Design, I taught about general issues of branding yourself in various scenarios and customizing this for your own initiatives. The aspect I believe in most is about creating and developing a network and community around your end goal, through supporting your community. We also used Yeh IDeology's fun magnets, designed by Mel Lim at Mel Lim Consulting Studio, as networking tools which put a twist on the motive of networking. The exercise, a partial ruse to play Memory or Go Fish, participants sought out and met people that owned icon magnets they had to match on their own Raffle Tickets. Mindset-wise, I believe in helping the community you want to be part of. Truly the term "paying it forward". To make a lasting impression, knowing the needs of those you meet and helping them as much as you also convey your own goals and aspirations. Our workshop successfully energized the participants and changing attendee perceptions of their own brand and purpose. As a result I almost couldn't stop the crowd from networking. And at the end of the workshop, the networking proceeded for several minutes after the lecture and through out the conference. During the second 10 minute exercise we discovered a 3 person connection resulting in immediate collaboration for business between the 3 individuals. Knowing what we had helped generate in just a few minutes of a workshop, just imagine what we helped generate through out the conference! People told me that they developed an overwhelming sense of altruism to the point they forgot about their own insecurities about venturing out to meet others and instead felt like stewards for their new friends. They were focused on how to help their new friends while sharing what they were looking for as well. This year's IDSA Northeast District Conference at the Rhode Island School of Design and as always I was blow away by the speakers, content and the energy of the conference. Throughout the conference, more than anything was this feeling of excitement to influence and change the world by everyone in their own way. In all the years I've gone to conferences and industry trade shows I often found the most inspiring and forward leading individuals populate this space the most. Of course there's a variety of reasons that people attend conferences. Those that are promoting their brand or company, those that are looking for new business or career opportunities. But many are there to either share best business practices and connect. I often find those that attend industry events tend to be more current, and leading the industry trends, the ones that are most connected and connecting others. It's especially interesting during times of economic challenge when you notice the few that push ahead while most stay in safety mode. One impressive talk John Maeda moderated was a collection of the leading young creatives pushing the boundaries of innovation and business. Several of the other speakers, like Scott Wilson of MINIMAL, Mike Branson of PearlFisher, Richard Watson of Essential Design stuck around to stay around and talk to the local professionals, students and other speakers. The students and young professionals I meet year after year are also the ones that I notice tend to find their career opportunities through the connections they make at these events. I also know companies that track the attendance list to seek out talent and to see who's out and about in the industry. It's so impressive to meet people like Sam Aquillano who was a merit award winner many years back quickly swept up by Bose Corporation and now the Co-Founder & Director of Design Museum Boston as well. And Sami Nerenberg I met a few years ago at the IDSA.NED conference as a budding graduate and this time she was a speaker sharing her new initiative Design for America that's sweeping the universities across the US. This is where you meet the new leaders of an industry. For Yeh IDeology I have to attend various industry events, conferences and organizations. I have to admit many are dry and boring yet necessary. Few have the collaborative atmosphere of sharing best business practices I find at industry events like IDSA and DMI. Here I feel like the community is collaboratively trying to advance and improve. Collectively we can do so exponentially faster and better. Another great example of how networking works! Alice Ro successfully collected 5 different magnets and went back to her office and shared with Marco Perry the founder of Pensa and the IDSA Northeast District Vice President organizing the IDSA Northeast District Conference in Providence, RI how much fun our successful networking event with our fun magnets was. I'm excited to tell you that in addition to my holding a workshop at the District Conference in Providence RI in April, IDSA.NED has asked us to develop a networking event there as well, and this time on a much grander scale through out the course of the 2 day conference. I hope you'll be able to come and join us up in Providence and expand your network and community of friends up there April 8 & 9! It's been a couple of weeks since our party and it's surprising how the reverberations from our party are still reaching out to us. We're still getting responses from people about how much fun the event was and how everyone met so many great new friends and connections. I have to say, now that we've gotten a taste of what it was like to create this inspiring moment we're curious what to do next. It's a shame not to recreate it again right? Do me a favor and share with us hear how the event went for you as well. Who did you meet. Did anything come of that night? And a question Yeh IDeology would love you to answer. Still warming up to this blogging thing. What advice would you like to know, about career, building business, networking, etc...? We'd love to hear your feedback and thoughts. Whew, what a great night Yeh IDeology's 5 Year Celebration turned out to be. In all the years meeting the best of the best in every industry category we've heard some of the best business practices and advice on running businesses, building and investing in design and strategizing career paths. Wanting to do more than just celebrating, we brought together some great friends and colleagues to share their insights with everyone and inspire us as we enter the new year. Our Speakers Yasemin Bernardete of Springs Global reminds us you have to identify and respect what makes each brand unique and hold true to that element. Brand strategy and brand management is becoming more critical than ever. Brad Lacey of Converse reminds us in this new day and age to never rest on your laurels and always have a healthy does of paranoia, always learning something new to stay current. Brand strategy is key here as well and Brad shares how critical it is to work with other divisions and collaborate. Joe Moya of MindsInSync talks about having been on both corporate side and consultancy side that knowing your core values is key as you represent yourselves to your clients and customers. Even firms need to stay true to their value proposition and know how to best represent their brand image. Cliff Kuang, the Founder of Co Design, tells us that with the uprising of technology and new crowd sourcing organizations now is the time to invest in that amazing idea that you had. Cliff cites how too many creatives are panicking and diluting their identity by accepting and taking on everything not standing firm to what they excel at. The panel discussion inspired us to venturing into 2011 with a new outlook, as we all reflected about representing ourselves and our true value propositions, we turned to the networking portion of the night. We were 150+ of the most talented individuals in the creative industries gathered in one room and here was a perfect opportunity to connect, learn about each others goals and initiatives and help each other in our mutual endeavors. As a fun exercise to spur the merriment, we gave out YehID magnets and an award was given to the first guest that successfully swapped magnets to meet 3 people, the individuals that the winner met also won prizes as well, rewarding the connections made. Meryem Tangoren was the first one to come up to us having successfully swapped and collected 4 of her 5 magnets and in the process she reconnected with old friends and met new ones. Meryem reconnected with old classmate Janet Villano of SkipHop, and met Dina Romanko as well. We then put a shout out to all of our friends and thanked everyone for coming out that night to celebrate and we broke into our delicious beautiful cake by Heather Barranco-Machado who has just opened DreamCakes. Think of Ace of Cakes and incredibly delicious in the tri-state area. Another great connection through her husband Jason Machado whom I've know in the industry for years. Right after the prize giving and cake cutting we couldn't stop the crowd going back to their feverish networking and merriment. It was amazing. So many friends and clients from past and present, as well as new came to congratulate us bringing along their friends they insisted that we just had to meet as well. I've planned parties and events all of my life. It's an incredible feeling when you've successfully created just the right moment, energy and vibe, and when you scan the room everyone is having a blast. That was this night. It's the bonds that you make that help you make things happen. And this night would not have been an absolute success without the great partnership and friendship of Stephan Clambaneva and his dedicated IDSA.NYC team (Courtney Hewitt, Jerry Mejia, Anthony Puleo, Daghan Perker) and their introduction to the Knoll team and the gorgeous expansive showroom. And take a look at the articles about our celebration, brought to you by the good folks at Core77 and IDSA! Attending Bill Taylor's book signing party last month lead to my meeting Peter Clayton ofTotal Picture Radio and Jobs In Pods. I do believe in serendipity, that things happen for a reason and that you do have to be at the right place at the right time. We got to talking and we found that our circles overlapped as we’re both are about promoting careers and leadership. The best unexpected thing that came out of this was Peter Clayton’s invitation to interview me for his podcast for Total Picture Radio. Peter interviews everyone and anyone relevant to careers and leadership, from the CEO of The Ladders Marc Cenedella to Zappos CEO Tony Hsieh. I was delighted when Peter asked me to speak to him to share our perspective of what it's like for companies to invest in design talent. In this podcast with Peter we get to touch on a bit of what companies have to consider when they look to invest in design talent and where they can invest in design talent in their business model. Yeh IDeology is fortunate that we have the opportunity to work with so many leading corporations and top design firms that have a high knowledge and respect for what design can do for business and already have a strong understanding how to invest in design. It's a pleasure and an honor working with clients that have a high education of design talent investment and thus our projects there are compelling and exciting. But we love working with the businesses and brands that are just at the nascent stage of learning about the many various specialties of design and the many ways design can impact and improve business (product development, strategy, marketing/branding, operations to name a few...). When we're able to help teach a company new to design, how to aptly build-in design strategy by either building an in-house design team, introducing key partnerships with design firms and/or design consultants, it's an incredible feeling when later on we see this company produce successful results through either launching great new products, new services, improved operations and/or a new brand positioning. Back on January 5th, 2011, I attended Bill Taylor's book signing Launch Party honoring the release of his new book "Practically Radical: Not-So-Crazy Ways to Transform Your Company, Shake Up Your Industry, and Challenge Yourself." It was hosted by Fast Company and TBWA. Attending this event was a perfect example of networking. Over all it was a great intimate event with some of New York's most interesting thought leaders and game changers and I ended up making some random connections and amazing events spun off of them. My dear friend Meredith Goodwin, Lighting Design Manager at Nulux invited me to this event and we ended up met some new and old friends. Here she is meeting Jean-Luc Mege and Brandon Williams, Senior Vice President at TD Bank, who she introduces me to. Jean-Luc Mege is a very well established photographer here from France making a new name for himself in NYC, no doubt it won't take long. Who would think that I would get to meet I get to meet the heads of my bank TD Bank at a book signing? Brandon Williams and Joseph Paradise, VP, Retail Market Manager of TD Bank not pictured here quickly put me in touch with my local branch manager Sheldon Berg, who within weeks came to my office to meet me. Little known facts- TD Bank is open on Fridays from 7:30am till Midnight. And they are the only banks with police officers stationed there. I do love how convenient they are, and for an entrepreneur business owner those extended hours really help me manage my time. This is the serendipity of networking. Randomly introducing myself to new interesting game changers at the party I met Peter Clayton founder of Total Picture Radio and Jobs In Pods. Within a few seconds we realized our circles overlapped as we're both about promoting careers and leadership. The best unexpected thing that came out of this was Peter Clayton's invitation to interview me for his podcast interview for Total Picture Radio which we recorded a month later (you'll get to read and hear about in my subsequent blog). I was lucky to have my copy of the book signed by Bill Taylor and in honor of the event, I had a blast standing up on the "Practically Radical" Soapbox together with Meredith declaring my "Practically Radical" New Year's Resolution. I declared my resolve to transform Yeh IDeology, shake up the industry, and challenge myself in 2011. Over all we had a great time catching up with old friends and meeting new ones. Here's Kofi Aidoo on my team with our industry friend JooYoung Oh, and our friend Ayse Birsel was there as well. Networking can deliver some great serendipitous results but it won't happen unless you get out there. I always find too that it's a lot more fun if you go with friends and collaborate helping each other meet people.